This shows a chronology of all events for the person or couple., including births, marriages, children births, deaths, censuses, deeds, and wills. The husband's events show on the left, the wife's in the middle, marriage and children spanning between them, and historical on the far right. For census, deed, and will abstracts, hovering the mouse over the event will show the full text of the abstract. Places are color-coded to provide a clearer sense of when and where someone migrated from place to place. Note: Events without dates or approximate dates are not shown. 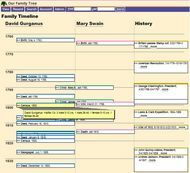 Containing much the same information as the vertical version above, this shows the couple, their parents, their children, and any recorded documents, but in a horizontal Gantt-style format. This is not about the one family, but more broadly about all people of a surname and / or of a place, and showing when they lived. At the top are options to change the surname, the place, and whose data are included. The latter two above use a format where you can scroll to the left and right by dragging the mouse, or if you have one, using the mouse wheel. Above the name are historical events happening at the same time to give you a context of when the people lived. Clicking any line or point opens a window with the specific dates, and a link to more details. At the very top of this format is a higher-level view showing the centuries and which centuries contain information.